There is a member of the black-coated tribe who has found political refuge in the Betel Leaf alliance after having sought shelter in several parties for brief spells. He is said to be making overtures to the Green Party these days. Making his foray into national politics by entering Diyawanna from the estate sector, this worthy thereafter, warmed himself into the graces of the former strongman professing fatherly love for him. 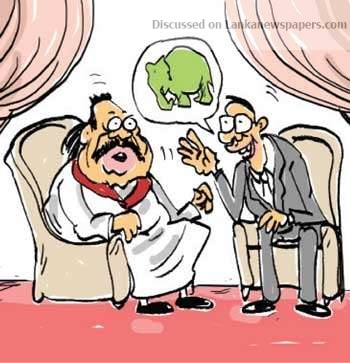 His fatherly love for the former strongman evaporated with the advent of the Maithri era which saw him becoming a faithful follower of the compassionate one. Finding that his political future uncertain in the Betel Leaf alliance which is fast cracking up, he had sent feelers to the Green Party hierarchy, but Mariks and Mujib had been quick to put a spoke in his wheel. He had expressed his willingness to contest Puttalam on the Green ticket. But the Greens from Puttalam too are up in arms against accommodating him on their list. So, the man at a veritable dead end is said to be down in the dumps these days, they say.